It's the Hebrew month of Elul, the month leading up to Rosh Hashanah, Yom Kippur, Sukkos, and Shemini Atzeret-Simchat Torah. Most of the year we eat braided challah bread on Shabbos and holidays. For the holidays mentioned above of the month of Tishrei, we often use round challahs formed in a spiral. 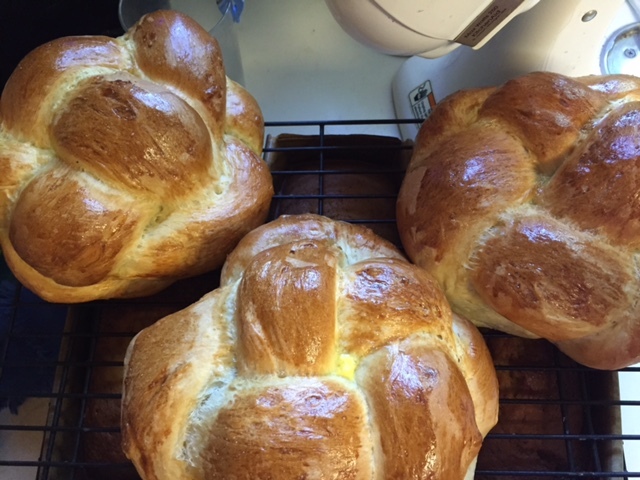 So logically (not) in Elul I like to make braided round challahs. it doesn't matter because the messy part gets tucked underneath. I've tucked the mess underneath and made nice tall round braided loaves. And now they're cooling, along with pumpkin bread, and brownies are in the oven.